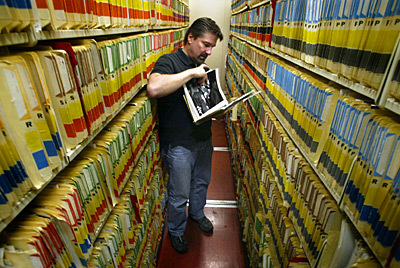 Scott Sommerdorf looking through old file photos in the photo archive of the San Francisco Chronicle. The first thing that strikes you is the silence. I've just walked into the aisle in the photo library at the San Francisco Chronicle where photos whose subjects begin with M thru R are stored. The shelves are about seven feet tall - and they are all packed with folders holding between 10-50 photos each. The effect of this wall of file folders on either side of me is striking. All the sound except my own breathing is totally muffled. The sound of the nearby newsroom fades away to nothing, and this eerie and unexpected silence helps reinforce the perception that I am about to step back in time. So here I am, standing in front of the M shelf, and you are wondering why I am taking you here. We are about to dig up some treasure that has been sitting here - forgotten - for decades. But first let me tell you what brought me to this place. For the last couple of years I have been responsible for entering the staff's work in annual contests. It's a busy time with all the deadlines that hit at the beginning of the year. So, during trips to the "morgue" (as some call it) looking for some elusive early edition clip, I noticed stacks of old prints from the darkroom days waiting to be filed. The darkroom - remember that? A lot of you reading this may have never made photos for a deadline publication in a darkroom - or, like me, have been away from the darkroom for years. Digital workflows now dominate our daily lives in this business and have taken us away from the creativity and camaraderie that took place in the darkness. Those stacks of pictures got into my head, and I began to think about how different things are now. Digital is great for journalism - faster, easier to make deadline, keeps us at the scene longer, and buys us time to get a more-timely photo in the paper. But with those advancements come some serious challenges. Namely - how do you catalogue your work? What media will store them in the most stable way? My trip to the basement was a wake-up call. Despite the size and awkwardness of storing prints in file folders, do any of us have an equally efficient way to keep our work stored and easily found at a moment's notice? Burning shoots onto CDs is pretty prevalent in the industry, but that is only half the ballgame. How do you file it? Do you cross-reference the subject's names or keywords? Will you be able to find the photo of that kid you shot in high school four years ago who just threw a no-hitter in the majors? Sports Shooter's digital guru Trent Nelson has been using a program called Extensis Portfolio ($199) http://extensis.com/portfolio/index.html?ref=local_prod. Trent says; "It's a great program for cataloging CD/DVDs. You make a catalog, drag your CD onto the catalog, and it pulls out a thumbnail and the caption of your images. It's well worth the expense, and also catalogs movies, sound files, text, music, quark files, whatever. I've got over 35,000 photos archived with this program." "The program has a quick search feature in the menu bar. You can simply type in a word or words into that box, hit return, and it will search caption, keywords, and file names instantly, displaying the results." Let's get back to the M thru R aisle. 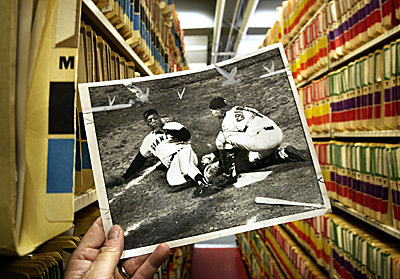 M … Willie Mays comes to mind, so I find two pretty huge folders packed with images of Willie Mays. They range from the early days with the Giants to his 1973 World Series against the A's as a N.Y. Met. What strikes me is that we made a lot of goofy, posed photos of athletes back then, but we also had amazing access. There were photos of Mays at home, on fishing trips, in the training room, and - strangely - of his wife doing the dishes. That kind of access now is extremely hard to get. The Chronicle's Deanne Fitzmaurice's recent story on Barry Bonds is one exception to that rule. The old photos have the feeling of an easier time in the clubhouse with no PR people in the way, and where players were more likely to greet you by name than give you the evil eye. There is a UPI photo of Mays looking through a photographer's Nikon in Cincinnati that caught my eye. It seemed like it came about during some casual conversation between Mays and the photographer on the steps of the dugout. 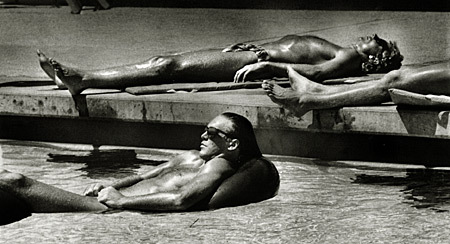 Joe Montana (top) and Dwight Clark (below) enjoy the pool at Sierra College, Rocklin as temps as high as 109 scorch 49ers summer camp in 1984. Another image - a great shot by Charlie Blagdon of UPI that captured the feeling of Mays' final trip to the World Series was the next one to jump out at me from the stack. It stands the test of time and would still be a great shot today. Next I moved to the Montana stack. A little more recent, these are mostly from the '80s - the 49ers decade of dominance in the NFL. Photos by Steve Ringman, Fred Larson and Tom Levy stand out. Montana standing on the sidelines during a game - apparently nursing an injury where he looks more like a fashion model than a Hall of Fame QB. Another one, of Montana and Dwight Clark at Summer Camp in Rocklin, Calif. shot by Fred Larson. I remember Fred telling the story about this one. The 49er brass (and probably Montana) was not very happy about this image of Montana and Dwight lounging in their bathing suits between practices at the team pool. After this image ran, the swimming pool was off-limits to photographers. 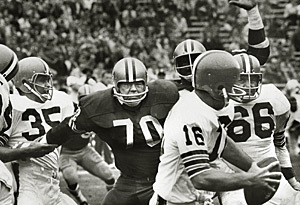 Going back further in 49ers history, I found this much older image of legendary DT Charlie Kreuger looking like an old veteran who was going to tear the head off Cleveland QB Bill Nelson in an Aug. 20, 1968 game. His calm, but menacing face inside that old helmet with a punter's facemask is the epitome of the early days of the NFL. A classic. Lastly, I indulge myself in a little research on my own home team's history. Remember Minnesota Viking's DT Jim Marshall and his wrong-way run with a fumble against the 49ers in Candlestick Park in 1964? Well, there it was in the "Marshall, Jim" folder right next to the folder of legendary music photographer Jim Marshall. SF 49ers' Charlie Krueger (70) is held by (35) Larry Doujar as he rushes towards Cleveland Brown QB (16) Bill Nelson in a game played August 20th, 1968. The print library should be visited by more of us. It's chock full of so much amazing work of those who had this job before us and from whom we can learn a lot if we take the time to look. That is what we're supposed to be good at right? I stole a few minutes to look through one more stack. Photos shot by Chronicle photographers - some of them still working, some of them retired or moved on. Some names stood out: Joe Rosenthal, Steve Ringman, Eric Luse and Gary Fong. I'd pay to have any number of them hanging on my wall, but here they were - stacked a foot high on top of each other. They looked sort of sad. They had their one day in print and that was it. They all have potential value - but only if they can be found. I've taken the best of these and had them scanned and inserted into our digital archive. That's the first stop for photo editors on deadline to find things, and also the best way to ensure these images live on for another 40 or so years when perhaps some other photographer comes looking to find a connection to the past.